GP Promotes Post-Humously Late Inspector Idris Musa to the Rank of Assistant Superintendent of Police “the Inspector Died as a Result of Injuries he sustained from IEDs Attack on his Team by Boko-Haram Remnant in Kano on 24th July, 2017. 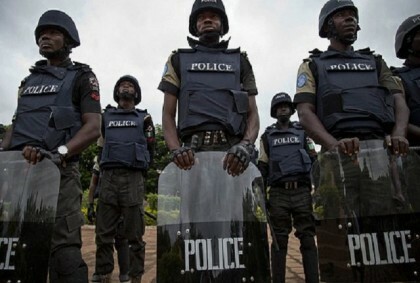 To ensure total success of operations Absolute Sanity currently ongoing on Abuja-Kaduna Highway aimed at routing out gangs of kidnappers and armed robbers terrorizing Abuja-Kaduna Highway, the Inspector General of Police has ordered the immediate redeployment of Area Commanders, Divisional Police Officers, all other Officers, Inspectors and Rank and Files serving in the Police Divisions, Police Stations and out posts situated on Abuja-Kaduna-Zaria Highways starting from Zuba Division in the Federal Capital Territory, Abuja to all Divisions and Police Stations and Posts in Niger State located along the Highway to Kaduna, and those other Police Divisions, Police Stations and Outposts throughout the Highways to Kaduna and Zaria City in Kaduna State. 2. New Area Commanders, Divisional Police Officers, other superior Police Officers, Inspectors and Rank and Files have been posted to take over from the outgoing ones. 3. The redeployment is to bring in new experience and fresh impetus to the fights against kidnappings, armed robberies and other violent crimes on these Highways, and ensure full execution of Operations Absolute Sanity’s strategies in achieving the stipulated mandates of the operations. 4. In another development, the Inspector General of Police has promoted post-humously late Inspector Idris Musa to the rank of an Assistant Superintendent of Police for act of bravery, gallantry and supreme sacrifice of losing his life in active service to his fatherland, Nigeria and the Nigeria Police Force. The late Police Officer will be remembered as one of the heroes of the Nigeria Police Force in the fight against Boko-Haram insurgency in Nigeria. 6. The Inspector General of Police has directed that the late Inspector Idris Musa be given a befitting burial.